"This is a wonderful microwave recipe that gets me going every morning! It's made with no added sugar, and plenty of oats and cinnamon for a warm, tasty breakfast. I also add turmeric and ginger for wholesome benefits." 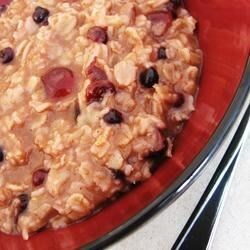 Place the rolled oats, cinnamon, cranberries, and blueberries in a microwave safe bowl. Add the turmeric and ginger, if desired. Pour in the water, and stir to mix ingredients. Cook on High until water is absorbed, about 2 minutes. Stir in orange juice to desired consistency. Had the potential to be 5 STAR.... but the turmeric was overpowering. I would cut it in half and double the cinnamon. I also added 1/2 a banana and it was yummy! Instead of the microwave, I use the double boiler. For added protein I add either walnuts or pecans.